On a cool, wet spring day, a dozen medical students at the George Washington University (GW) School of Medicine and Health Sciences (SMHS) stood in line, anxiously awaiting entrance to a town hall featuring Emmanuel Macron, president of the Republic of France. “We are training to become 21st-century physician-citizens and recognize that being globally aware is important for us to provide the best care locally. Opportunities like this are why many of us choose to attend GW,” explained Harleen Marwah, a second-year medical student at SMHS. During the town hall, Macron spoke to 1,000 GW students and took questions from the audience on a variety of issues. He was in Washington, D.C., for the first state visit of President Trump’s administration and participated in the town hall as part of his administration’s outreach to young people and students. “I know that President Macron is a fierce advocate for the planet, and I was interested in how he tailored his message about climate change to galvanize young Americans,” said Marwah. Prior to medical school, Marwah worked at the intersection of climate change and health and participated in the UN Climate Change Conference 2015 in Paris as a youth liaison. Fellow classmate Natalie Rosseau was also eager to hear Mr. Macron’s perspective on climate change, as well as global politics and French domestic issues. The majority of tickets to the town hall were provided to GW students via a lottery system. Rosseau and Marwah received lottery tickets specifically slotted for the medical school. Interest was high, and the 20 tickets were snapped up in minutes. 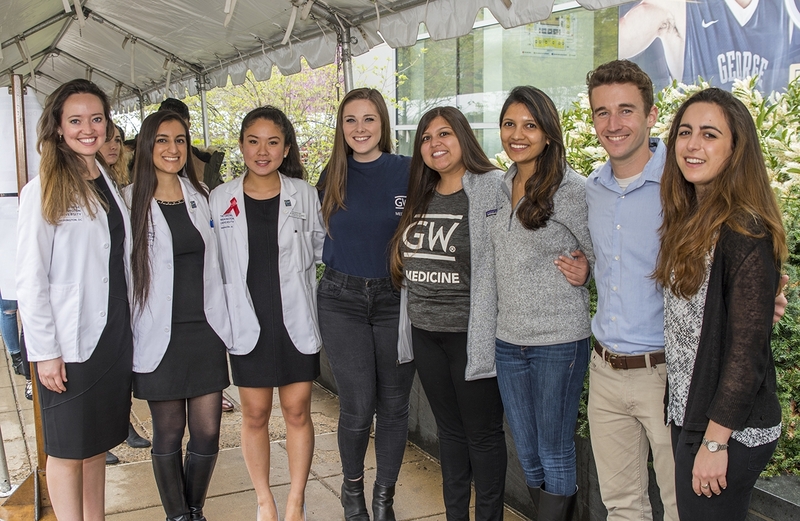 “I think there was so much interest among medical students because of the kind of aspiring clinicians that GW attracts – medical students who are committed to becoming a physician-advocate, or physician-policymaker, or physician-researcher,” said Rosseau. She went on to explain that because many of her classmates worked in health policy before starting medical school, they appreciate the ways in which politics and the social sciences influence clinical practice.